See Weather & Snow Depth Report Details here. 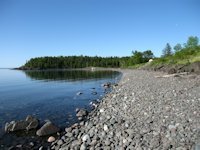 Here's some photos and information on some of our winter time visits to spots we had visited in the summer: the Sonju Harbor Trail, Gooseberry Falls State Park, Split Rock State Park, and Beaver Bay. In a later winter we also traveled to the North Shore to see the John Beargrease Sled Dog Festival as well as doing some snowshoeing. 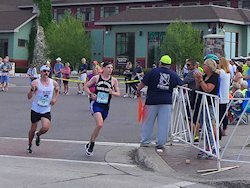 The John Beargrease race course runs from Duluth to north of Grand Marais and runs over four days and nights. We stayed at the Two Harbors Americinn as having a base camp at Two Harbors allowed us to travel the 20 miles to Duluth to see the start of the race, watch them at check points as they approached Two Harbors, and then catch them at check points later the next day as the teams made progress towards up the North Shore. You can see our pictures and commentary on the John Beargrease Race here. 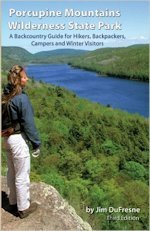 The article and pictures to follow were from a mid-winter time period when we traveled toin February to enjoy some winter recreation and visit some of our favorite summer haunts - including seeing how waterfalls looked in the winter. We were surprised to see the town almost as busy as in the summer. Lots of snowmobilers heading north and a surprising number of fishermen - most fishing along the Lake Superior shoreline. I later learned that the fisherman were after Kamloops Trout - a recent introduction into Lake Superior from a strain of Rainbow Trout native to a lake near Kamloops British Columbia. After getting settled into our motel, our first stop was at the office/store of the Superior Hiking Trail Association to get some hiking trail maps (and I also scored with a valentine's day gift for Joanne!). 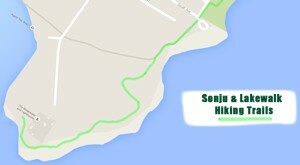 Then we headed to Agate Bay to snowshoe the Sonju Harbor Walking Trail. Later that evening we dined at the Vanilla Bean Cafe and Bakery. < < < This is the entrance to the Sonju Trail as seen in the summer - imagine snow and no leaves on the trees for the winter shot I did not get! < < < The trail then turns away from the lake to go through a wooded area. 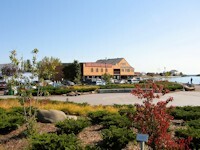 < < < Another scenic vista along the lakeshore. 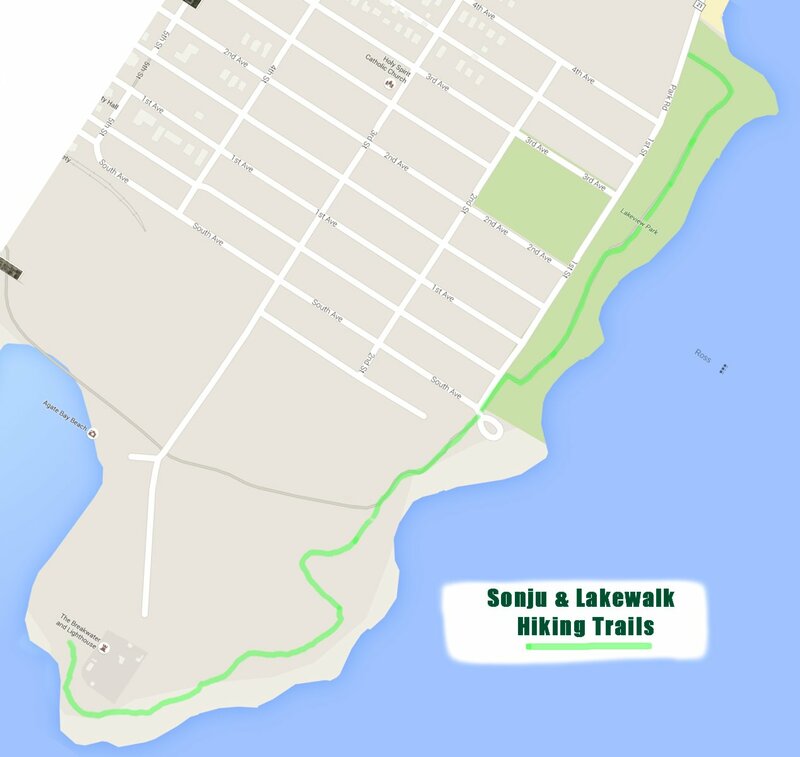 The Sonju Trail officially ends here, but there is a paved path that connects up with a second trail that goes through the Burlington Bay Lakeview Park. < < < Looking north along the Lakeview Park hiking trail. < < < On the way back, we took a spur trail away from the lake through the woods and surprised a few Bambis ! A wintertime view of the Split Rock Lighthouse from a wayside off Highway 61. 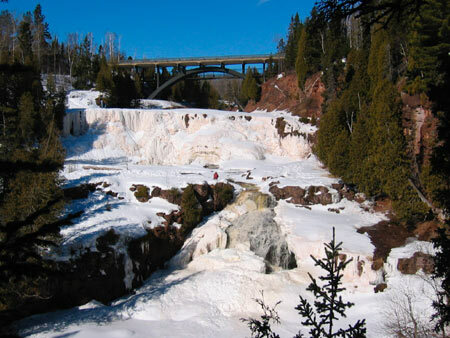 From the parking lot by the bridge crossing the Split Rock River, there is a spur trail of the Superior Hiking Trail that eventually leads to this attractive little waterfalls (pictured here hidden under snow and ice! ).The round trip is about an hour. Jo and Hans take a break on the way back. (Check out the size of that White Birch tree. They rarely get that big in our region.) The hiking path was so well trodden that we elected not to use our snowshoes. Actually as we discovered too late, a better trekking path for snowshoes is running up the bottom land adjacent to the river bed. Taking this route, you get to see scenery and vistas that aren't accessible in the non-winter seasons. 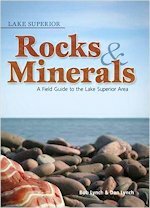 Split Rock State Park is open for winter camping and has a number of groomed cross-country ski trails - as well as hiking/snowshoe trails. 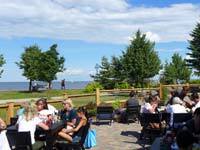 Gooseberry Falls Visitor Center is open all winter and is busy too. The park offers access to some major snowmobile trails so you'll see lots of snowmachine trailers in the parking lot. But it also has many great cross country ski trails and snowshoe trails too - so the winter visitor population is an interesting mix of silent and power sports enthusiasts ! We hiked along all 3 types of trails. We also did some trail blazing - as you can go anywhere with snowshoes. But Hans kept breaking through the hard snow crust causing Jo to worry that he might pull a muscle or break a leg. So it was back to the well-trodden trails. < < < The entrance to the Gitche Gumme snowshoe trail. Here's the snow and ice covered Upper Falls with a pool of open water below it. < < < The Lower Falls was not completely frozen, but the path I was standing on was a sheet of ice! As with Split Rock trails, you could also get by sans-snowshoes on the main trails because the snow was well packed. Lots of great scenery. We could have easily spent two more days there hiking and snowshoeing the trails. 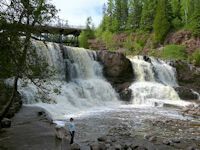 Gooseberry Falls State Park Trail Map & Facility Info. Skiing the Minnesota North Shore . 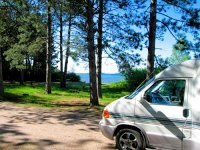 A Guide to Cross Country Trails in Minnesota's Spectacular Lake Superior Region.